The time to travel to San Diego is now! With unbelievable weather and thriving business, your corporate stay will be the perfect blend of holiday fun and business functions. Whether you’re heading to San Diego to meet with potential clients or business partners, focus on team building, or have a conference with existing customers, Foxwood Corporate Apartments will provide you with corporate housing that’s fit for top executives. From the 5 acres of greenbelt garden park that Foxwood is located on to the heated pool and spa, you’ll feel like you’re living in a luxurious resort. During your free time, you’ll love lounging poolside or swimming some laps in the centrally located pool and BBQ areas. Foxwood has a quiet and relaxing environment that’s ideal for soaking up some rays or getting some work done in your corporate accommodations. Our one- and two-bedroom corporate housing packages offer many perks for the traveling businessman. With a full-size kitchen, small dinette, and spacious living room, you have the ability to cook up meals, work on business plans or catch the daily news all from your apartment. Designer decorated and fully furnished, your corporate apartment will be waiting for you as soon as you touch down in San Diego. On top of many amenities and beautiful apartments, you’ll also love the great location near the I-5 and I-805 freeways that take you right into downtown San Diego, Mission Valley, and other business districts. For more information about our corporate accommodations at Foxwood, visit us online! We have photos, videos, and virtual tours, so check out where you could be staying in America’s Finest City. We look forward to housing you during your next business trip to San Diego! The U.S. Navy frigate Rentz pulled out of San Diego Naval Base on Thursday, July 25 for a seven-month deployment to patrol the Eastern Pacific and Caribbean. Known for its contributions towards Operation Martillo, the crew of USS Rentz will continue to fight against drug traffickers and stop the flow of narcotics through this water passage. Operation Martillo is a multinational act to reduce the amount of trafficking along coastal waters in Central America. The main mission of the Rentz will be to increase security within the Caribbean and Eastern Pacific waters and disrupt channels of narcotics and human trafficking. Commanding officer of the Rentz, Commander Lance Lantier, shared his thoughts on the Rentz deployment: â€œIt’s a very good mission, and we’re very good at it. It’s an extremely busy stretch of water.â€ Commander Lantier and his crew are not strangers to this area; this is their second deployment of this nature. There will be a special drug interdiction team on the Navy ship, which will consist of the â€œVisit, Board, Search and Seizure team that will support the Coast Guard Law Enforcement Detachment. Another huge contributor to the team on USS Rentz is the Helicopter Anti-Submarine Squadron Light 49, which is based at North Island Naval Air Station in Coronado. Frigate Rentz will also be participating in the 2013 multinational UNITAS maritime exercise in September. The exercise is an honor to attend and will be off the coast of Colombia in the South Caribbean. Other participants will be from Naval branches in Colombia, Honduras, Chile, Brazil, Peru, England, the Dominican Republic, and Canada. Foxwood Corporate Apartments knows what’s best when it comes to temporary housing in San Diego. Our resort-style ambiance and affordable accommodations make it reasonable to take an extended summer vacation or explore a part of the U.S. you’ve never seen before. Our fully furnished apartments are spacious and open, allowing you to have enough space for the family or a couple heavy packers. Whatever the reason or cause of coming to San Diego, your temporary home at Foxwood will certainly exceed your expectations. If you’re coming for a getaway, our quiet and unique environment is ideal for lounging poolside or taking in the gorgeous scenery. Located on a large greenbelt garden park, nature blossoms around every corner with large shade trees, beautiful gardens, and lush greenery. The heated pool and spa are located in the center of Foxwood Apartments so no matter where you’re located, you’ll always be steps away from relaxation. 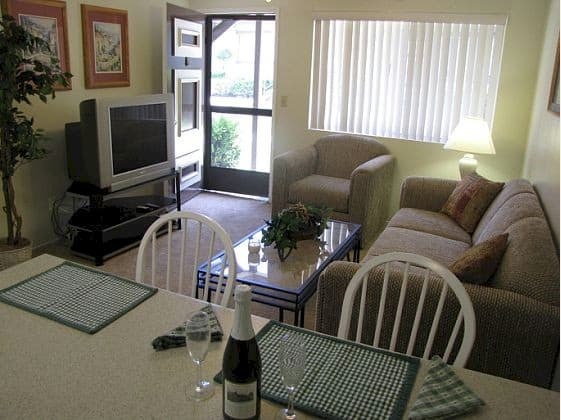 If your intentions in San Diego are mainly to see top attractions, the location of Foxwood Corporate Apartments can get you to where you need to go quickly and efficiently. Â The I-805 is one block away and the I-5 is just eight blocks down the road. Simply hop on the freeway and head to any of San Diego’s coolest areas. We are 20 minutes away from the Coronado Naval Base, downtown San Diego, Mission Valley and the beaches! A bus stop across the street also makes it convenient to take public transportation during your temporary stay. With a great location and a wonderful place to relax, you’ll find it completely comfortable to call Foxwood Apartments your home away from home. Contact us today to begin your application process. We look forward to housing you on your magical trip to San Diego. An extremely rare archeological treasure was found on San Clemente Island last week. The U.S. Navy recently discovered a prehistoric boat model made out of volcano lava about 90 miles off the San Diego coastline. San Clemente Island, which is owned by the U.S. Navy and holds large training operations, is part of the southern Channel Islands. Although the island is uninhabited, there have been traces of human occupancy on the island dating back 10,000 years. The recent finding of the prehistoric boat effigy happened in the center of the island. This newly discovered archaeological site is riddled with artifacts. According to a Navy news release, this boat effigy was first spotted during an archaeological survey. It is alleged that Native Americans had occupied San Clemente Island in earlier times. This boat effigy could definitely belong to the Native American inhabitants that once lived on the island. Beat the heat in your apartment with these fun ways to keep you cool under the San Diego sun. Without blasting the AC and receiving a large electric bill, try some of these solutions to keep summer heat away and save some money! Fans are one of the best ways to cool off your apartment on a hot, summer day. By circulating the air around your apartment, a fan can create a breeze that pulls the air through a room allowing it to stay cool. Ceiling fans are also wonderful as they’re cost efficient and very effective at creating a nice draft. Rather than sitting in front of a fan, set up two fans that will get a nice breeze circulating through the room. This is the best way to keep your apartment cool with fans. A great way to keep yourself cool during the summer is to have an ice cold drink! Beat the heat from the inside out with a refreshing drink on hot afternoons. Popsicles, frozen snacks, and fruit will also do the trick. So, fix yourself a cold snack or beverage and cool yourself from within. Air conditioning is the most expensive way to keep your apartment cool, however, using the AC sparingly will definitely make a difference in the coolness of your apartment without hurting your wallet too much. Use the air conditioning about an hour before bed or for an hour during the day. Just a little bit of cool air goes a long way! Give your apartment the instant relief it needs without running the AC all day long. When sunlight enters your apartment, it quickly turns to heat. To avoid unnecessary heat, invest in thick blinds or curtains that will help to keep your rooms cool. Allow a few windows to bring in some light but cover the rest; your apartment will feel much cooler by blocking out this unnecessary attraction of heat. Electronics can generate heat quickly. To avoid overusing your electronics and creating more heat in your apartment than necessary, simply turn off the electronics that are not in use. You will notice a difference in temperature as soon as you get into the routine of unplugging your appliances and electronics.